A view of the other side of the mug. 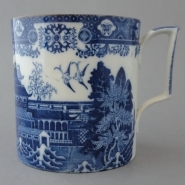 A large earthenware mug printed in blue with the Fig Tree pattern. The rim of the mug is enameled in brown. It is a wrap-around pattern covering the entire circumference of the mug. The exterior border is made up of geometric motifs with oriental symbols. The interior border is the same as the inner border used on Stevenson's Willow Pattern. Hollow ware pieces were infrequently marked. As such, this marked version of the pattern is considered rare and identifies Stevenson as the maker of this early 19th century pattern. The same pattern is also found on brown ware printed in yellow underglaze.